Lothar and Dr. Karin Pirc, Ayurvedic clinic directors, in front of the famous Maharishi Ayurveda Clinic in Bad Ems, Germany. Situated along the scenic Rhine River, home to many historic castles and fortresses, the clinic occupies the former German imperial palace of King Wilhelm II. Bad means “bath” in German. Ayurveda stresses a balance of three elemental energies or doshas within each body — vata, pitta and kapha — and outlines specific measures of healthful living known to correct dosha imbalances that are the cause of disease and toxicity. Treatment programs are tailored to each individual’s constitution and include a thorough Ayurvedic assessment, dietary and herbal remedies, detoxification procedures, specific recommendation for yoga/exercise and meditation. Patients must be active participants in their healing because many Ayurvedic treatments may require changes in diet, lifestyle and habits to restore balance. Panchakarma, meaning “five actions,” is an Ayurvedic therapy that purifies the body by cleansing its deep tissues of toxins and opens subtle energy channels to increased life energy, health and immunity. A full treatment includes at least five different procedures over a period of several days or more, usually in a retreat or clinic setting. In countries where citizens enjoy more vacation time, panchakarma retreats are popular destinations allowing people to use their vacation time to de-stress, detox and rejuvenate on a regular basis. Without the extended stay, individual panchakarma treatments can also provide relief from ailments and reactivate the body’s own self-healing and self-repair mechanisms. The images most popularly associated with Ayurveda — abhyanga (the two-person synchronized oil massage) and shirodhara (the steady stream of warm oil poured over the forehead) — lend a luxurious and exotic air to a medical system that is anything but mysterious. Thoroughly grounded in practical knowledge, Ayurveda provides a complete system of natural healing, disease prevention and enhancement of immunity for the human body regardless of race or location. Nestled amidst 215 acres in the quintessential New England countryside, the Maharishi Ayurveda Health Center Lancaster in Lancaster, Massachusetts opened its doors in 1985 when few people in this country had even heard of Ayurveda. Established as the first Maharishi Ayurveda clinic in the West, for years it was widely regarded as a health spa for celebrities, presumably attracted to the glamour of the extraordinary healing treatments imported from India via famed Beatles guru Maharishi Mahesh Yogi, founder of the Transcendental Meditation program. As familiarity with alternative medicine grew over the next two decades, more people began seeking out the benefits of Ayurveda themselves, peering past its exotic aura to discover a complete and natural healing system of medicine noted for its success with chronic conditions. Despite this increased interest, the Lancaster center eventually struggled to generate the resources required to update its facility. 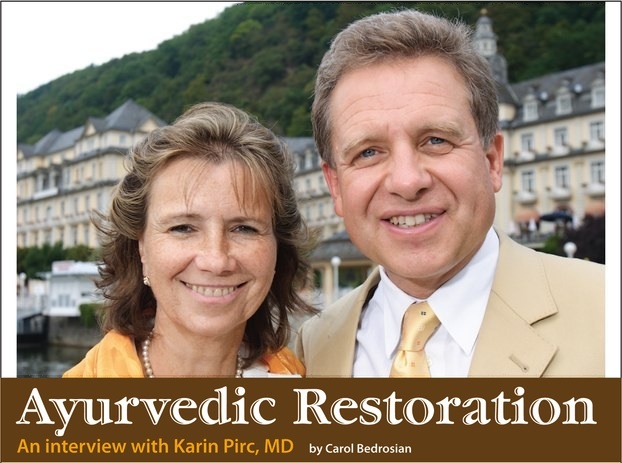 Enter Lothar Pirc, managing director, and Karin Pirc, MD, medical director of the famous Maharishi Ayurveda Health Center Bad Ems in Bad Ems, Germany. Founded in 1992, the center is one of the leading Ayurveda institutions in Europe. Dr. Pirc was the first European to receive the Indian Global Hakim Ajmal Khan Award of “Best Ayurvedic Physician 2006” for outstanding achievements in the field of Ayurveda. When I visited the Lancaster center last fall to meet the new directors and sample Ayurvedic treatments there, it was obvious the Pircs had wasted no time in their restoration. A gentle aura of well-being permeates the beautiful acres of forests, meadows and lawns, carried indoors where every nuance of design and function gracefully emanates healing intention. During the visit no detail of my comfort was overlooked, culminating in the blissful three hours of purification during the warm, aromatic oil treatments of abhyanga and shirodhara. The Pircs were due to return to Germany the following day so I scheduled a phone interview with Dr. Pirc for a later date and floated home luxuriously relaxed and rejuvenated after my treatment. One of the most experienced Ayurvedic physicians in the western world, Dr. Pirc opened the first Ayurvedic clinic in Germany in 1986 and has treated more than 20,000 patients from around the world. She is an MD with a Ph.D. in psychology, has authored eight books on Ayurveda and now serves as the medical advisor in Lancaster, while maintaining her practice as medical director in Bad Ems. Dr. Pirc engages Ayurveda with a systematic thoroughness that reveals both its practical, cost-effective simplicity for daily health maintenance and its effectiveness as a comprehensive natural medical system that is free from harmful side effects. Carol Bedrosian: How did you come to be involved in Ayurveda? Karin Pirc: I had the idea when I was a small girl that I wanted to help people with their body and their mind. So that was the first thing. I was very sick when I was a girl and at 19 years of age I started Transcendental Meditation. Gradually the whole disease went away so I was very interested in meditation and thought the spiritual dimension should also be included if you treat people. I studied psychology first at the university, and then I still had time, so I studied medicine. When I was 33 or 34 I heard about Ayurveda, though I hardly knew what it was. A seminar for doctors was being offered in the Netherlands and I was in a situation where I thought I could try something new, so I went. After some days of training, I thought, “Wow this is exactly it.” I always had the feeling there should be something like this in medicine but maybe it will come in 2050, very far away. The training was very systematic so I went home with all I had learned in those 4 weeks and started incorporating the new approaches with my patients. I was very lucky to have a place to start right away. I could give a lecture to about 800 people at that time and it went out right from the beginning and spread. Carol Bedrosian: So what is it? Karin Pirc: How can it work? After the 6 months I was absolutely sure I would stick with it because of seeing these miracles everyday. In the next few years I did more doctor trainings to go deeper into the knowledge. It’s really great how much help you can give to people to really recover and understand what their body and mind are for and how to use them in a happy and healthy way. Carol Bedrosian: Are you strictly doing Ayurvedic treatments now in your own practice? Karin Pirc: Yes, because if you want to do something really, really good then you have to stick to it. And Ayurveda is so comprehensive. We have herbal preparations, we have rejuvenation, we have meditation, we have yoga, we have the purification treatments, and people can do the beneficial self-massage at home and breathing exercises. All these things are included in Ayurveda and I still don’t know everything. It’s a lifelong study and experience and I think it’s good if you concentrate on just one holistic health care system. Carol Bedrosian: Can you tell me a little bit about your clinic in Germany? Karin Pirc: The Maharishi Ayurveda Health Center in Bad Ems is very well known and patients come from all over Europe to be treated here. We are not a hospital, but we have the capacity to treat and accommodate about 40-50 patients at a time. They live in the hotel area and they can walk right over to the treatment area in their gowns. It’s very cozy for them. We have a large Ayurvedic treatment area and doctor consultation rooms, a yoga room, a meditation room and two or three lecture rooms. We give lectures every evening so guests can learn about their body, their mind and about Ayurveda so they are motivated when they go home to change some things in their lives. Carol Bedrosian: What makes your clinic so successful? Karin Pirc: I think it’s the successful treatments that are most important and also the orderly, structured and friendly way in which all the employees treat the patients. We are always improving our clinic. Just like in the United States, people have to pay for this themselves. It’s quite expensive because with Ayurveda you basically need two employees for every patient. So for 40 patients we have 80 employees; it’s not a cheap thing. Carol Bedrosian: It’s very labor intensive. Karin Pirc: It’s not only the treatments, but also what the patients don’t see in preparing things. Everything is freshly prepared — the herbs, the medicated oils and pastes — all these things sum up to a large labor cost. Sheets and the towels have to be replaced every six months because they are worn out by all the washing from the oils. The most important thing is the transformation and deep rejuvenation a person feels from the treatments. The Ayurvedic purification treatment basically is ten days. You start with a gentle internal cleansing, and for that you need at least 3-5 days. You can take more but that’s the smallest time possible to start. Then after that there’s all these wonderful massages and detoxifying procedures. The ten-day treatment is a systematic way of loosening toxins, bringing it to the eliminative systems like sweating, the kidneys, the intestines and purifying all the organs. Once the impurities go out of the body, a person feels much better after that. There is just no chance you will go out of here and not feel better because you feel better when you are pure. It’s very easy. Carol Bedrosian: Do people stay longer than ten days? Karen Pirc: For people who are just tired and overworked and need some purification and refreshment, ten days makes a big difference in their wellbeing. If you are seeking more profound balance or have a chronic condition, 14 days or more is appropriate. After the in-residence program, the doctor will make personalized recommendations to use at home including herbs, exercise, diet and daily routine. Carol Bedrosian: How is Ayurvedic health care perceived in Germany? Is it very popular? Karin Pirc: It is quite popular. I would think that at least most people in Germany have heard the word, but we are a smaller country and when we first started with Ayurveda, nobody knew it. Now many hotels offer the wellness part of Ayurveda — not with the sophisticated quality that we offer — but it is quite well known. When you go to a sauna, many offer Ayurveda massage. It doesn’t really have much to do with Ayurveda, but at least they use the word! Carol Bedrosian: Overall, how is the healthcare in Germany different than it is here in America? Karin Pirc: We’re all forced to have health insurance in Germany, which is quite expensive. It can be a state run or private one, but you are forced to do it and it costs you many hundred euros per month. It is really a big part of your income. For that you get nearly everything free. Free means you pay for a recipe [prescription] just 10 euros. But basically what you get is modern medicine only. You are forced to pay hundreds of euros a month and you are not allowed to decide what you get for that. There are three private insurances that pay for Ayurveda but the additional monthly premium you have to pay is much higher so I’m not sure if that’s a good idea to take it or not. So it’s basically like the US and people have to pay for Ayurvedic medicine from their own pocket, including panchakarma and other treatments that are expensive because of the labor and preparation involved. But there are many things that anyone can afford. Sometimes just the right preparation can give you back all the energy, vitamins and minerals you need. For example, one patient who did not have much money, I was so glad about the success with his remedy I called my husband to tell him! He had hypertension, depression, diabetes, blindness from diabetes, and he hardly felt his feet anymore due to the diabetes. His improvements were so dramatic that he was able to reduce many of the modern medicines he was taking that may have been contributing to his problems. And that’s what you see with Ayurveda. It was not expensive for this man so it was really worth it. For any of the major diseases, if people knew what great things could occur, they would try it — get their diagnosis and take the preparations. Normally, you’ll feel the first improvements quite quickly — after 3, 4, 5 weeks — and eventually the symptoms will reduce until they are gone. And that’s what we want. This other goal of modern medicine to just suppress symptoms for the rest of your life and tell people it is a chronic disease that cannot be cured is, fortunately, not true if you treat with Ayurveda. Carol Bedrosian: I thought Germany was overall more progressive and holistic with their healthcare. Karin Pirc: Yes, I think so. But all the pharmaceutical industries have tons of money and they go to all the politicians, so they have everything. They have the money to do the studies. The studies today are so expensive. A little study with 30 or 60 people will cost you millions and who can afford it? Nearly all the studies that are done here are pharmaceutical-sponsored. So in that case the US people are better off. Carol Bedrosian: Why is that? Karin Pirc: Because the NIH pays for studies in the US. I know they have paid about thirty million dollars for studies on the effects of TM [Transcendental Meditation] on high blood pressure and reduction of arthrosclerosis. In that part they are freer to go in a more holistic angle to see if there’s anything healthy we can give to our people to reduce all these modern problems. Carol Bedrosian: Do these studies focus more on TM rather then other Ayurvedic treatments? Karin Pirc: These big studies, yes, but we have some other Ayurvedic studies. A study was done in the US with panchakarma patients showing that approximately 50% of herbicides and pesticides that are stored in the fat tissues were reduced by up to 50% in 12 days. And that’s what the patients feel — this lightness and easiness in the body when they do the treatments. When all this mud goes out, you feel it. It’s not just something theoretical. That’s why I say it’s not possible for you to come out being less healthy than before you went in for treatment. Drink hot filtered water. Boil your water for 10 to 20 minutes in the morning and store it in a thermos so it’s available throughout the day. This hot water goes more quickly through your cells walls than cold water and the purification is deeper. Drink this as hot or as warm as it is convenient for you. In a week or two, you will start to feel more lightness in your body. It also takes the edge off the feeling of having to eat a little chocolate here or a little bread there so you can more easily stick to three meals a day and not eat things in between. You can add some fresh ginger slices in case you feel extremely heavy and congested, which makes it more purifying. Eat large meals earlier in the day. Eat as early as possible, not later then 6:00pm. Avoid heavy-to-digest foods like meat, fish or cheese in the evening. Keep it light, like soup, grains, cooked vegetables, noodles, fresh tomato sauce, etc. Eliminate between meal eating. Drink hot water instead. It may be boring, but it works! Liquid fast one day per week. If you want to reduce weight and your amount of toxins, take only liquid food one day a week, no alcohol. You can have fresh juice, fresh soup from vegetables or grains. Take this 3, 5, 7 times a day — you don’t have to be hungry — and have the hot water in between. The next day you will feel light, the way you should be. It’s very quick, but, of course, it needs a little discipline. When you first begin and especially if you have lots of toxins stored in your cells or you have a diet where you eat meat two times a day and drink lots of cola or alcohol, you may get a headache after six hours or so. This is a good sign that the toxins from your cells are circulating in the blood and can be flushed out. When you repeat this fasting day for several weeks it gets easier and easier since the body doesn’t need to digest so much during this day and it can release all the rubbish from the cells. If you drink the hot water you will see in the first week the headache comes on after 6 hours or so, the next week after 8 hours and then 8 hours again until gradually it stops. The hot water is very important. It liquefies waste and toxins so they are easier to get rid of. The heat of the hot water increases metabolism, which increases purification. I could talk for 3 hours about hot water. Avoid iced drinks. If you go to countries where there is a warm climate and the people have been there for centuries, nobody drinks cool things. They all drink warm things like teas. When it’s warm outside the body metabolism gets reduced because the body has to cool down as a natural reflex. So it starts with sweating. All the heat goes outside so you have less power to digest. You will also see in these countries they have many hot spices for their food, which they need to gain more digestive power. But the American people didn’t bring the culture to this country to have warm teas. Now they want to reduce the outer heat with cold drinks that cool you down perfectly in the first moments when you drink, but it also cools down your digestive system so you cannot digest so well. I believe that a big portion of the overweight problem in the US is from people drinking ice drinks. Increasing the metabolism power inside the intestines with hot drinks helps increase weight reduction. It’s very simple and very cheap; you just have to do it. Interviewer Carol Bedrosian is the publisher and editor of Spirit of Change with 25 years of satisfied experience using all natural healthcare. She can be reached at carol@spiritofchange.org or 508-278-9640, ext 3. Learn more about Maharishi Ayurveda Health Center Lancaster at http://www.lancasterhealth.com or call 877-890-8600. This entry was posted on August 5, 2010 at 12:55 pm and is filed under Articles, Health. You can follow any responses to this entry through the RSS 2.0 feed. You can leave a response, or trackback from your own site.